First and foremost, one of the biggest trends you can expect for influencer marketing in 2018 is brands and influencers being more transparent about their partnerships. In the early days of influencer marketing on social media, not every brand was as open as they should’ve been about working with some of your favorite social media stars or celebrities. Basically, a lot of influencers created Instagram posts, YouTube videos and other content promoting products without disclosing they were being paid for it. As you can imagine, that’s a big no-no. The FTC put their foot down in 2017 and clarified what brands and influencers need to do when working together on sponsored content. If you want to avoid facing any type of legal troubles, make sure the influencers you work with clearly disclose that they’re being compensated for promoting your brand. It’s as simple as putting #ad or #sponsored in their post. Plus, Instagram has made the process even easier with its branded content option. With this feature, the influencers you work with can easily (and clearly) disclose when a post they share is part of a brand partnership. This is super helpful if you’re doing influencer marketing on Instagram. Disclose every paid piece of content. If you signed an influencer to create five posts next month, you can’t just have them disclose that you’re working together in the first post and not the other four. Even if the content seems like an obvious ad, you need to disclose the partnership in each paid post. Check each paid post. Don’t assume that just because you asked the influencer to put #sponsored in their Instagram caption that they’re actually doing it. Review each paid piece of content and make sure they’ve noted that they’re being compensated. Otherwise you put your brand at risk. Use something less spammy than #ad. The FTC has stated that there are other ways for influencers to disclose partnerships. Generally speaking, people don’t care for ads and there’s somewhat of a negative connotation to them. People assume ads aren’t as genuine. However, you can use something something like XPartner, where X would be your brand’s name (i.e. #DunderMifflinPartner). No need to overcomplicate or overthink it. Just make your partnerships clear and avoid trying to deceive your audience. A lot of brands and marketers automatically associate influencer marketing with Instagram. 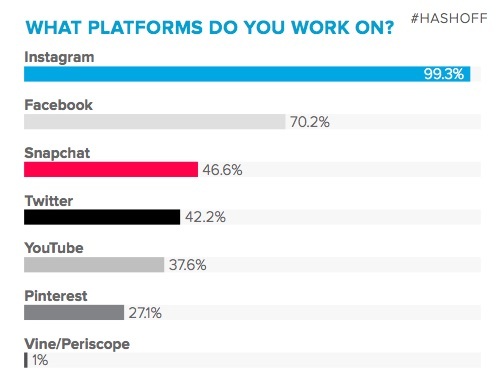 In fact, one survey found that Instagram was the No. 1 platform for 92% influencers in 2017. While Instagram is likely to stay at the top of the list, that doesn’t mean you should ignore every other channel. 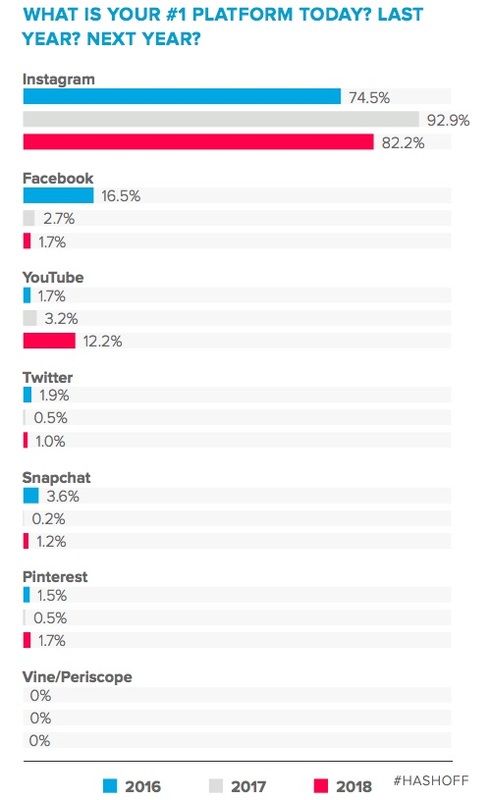 The same survey showed that influencers are also active on Facebook, Snapchat, Twitter, YouTube and Pinterest as well. Here’s why this should be appealing to your brand. Most influencer base their pricing on their following, engagement and demand. If they’re getting a ton of offers to promote brands on Instagram posts, it’ll likely drive up their price because of the perceived value. But that same influencer might not have as large of a following or as much demand for advertising on Pinterest or Snapchat. As a result, their pricing on those networks will likely be significantly less than they’d charge you for working together on Instagram. In 2018, consider other platforms to work with influencers on that other brands might be ignoring. While you may not reach the same number of people as you would on Instagram, you could generate a better ROI if you’re paying less and getting better conversions. Also, keep in mind that not all influencers are on Instagram and YouTube. Look through Medium, Pinterest (Pinfluencers), blogs and other platforms where your target audience might hang out. As influencer marketing started to become more popular, two of the biggest challenges brands ran into was finding influencers and managing the relationships. Browse through Instagram or YouTube looking for people who might be a good fit. Send them a DM or email if you can find it their email address. Go back and forth for a while negotiating the terms of the partnership. After you come to an agreement, send payment and wait for the influencer to execute. Come up with a scrappy way to track the partnership. While that process can work, there’s a growing number of platforms and influencer marketing tools to make your life much easier. 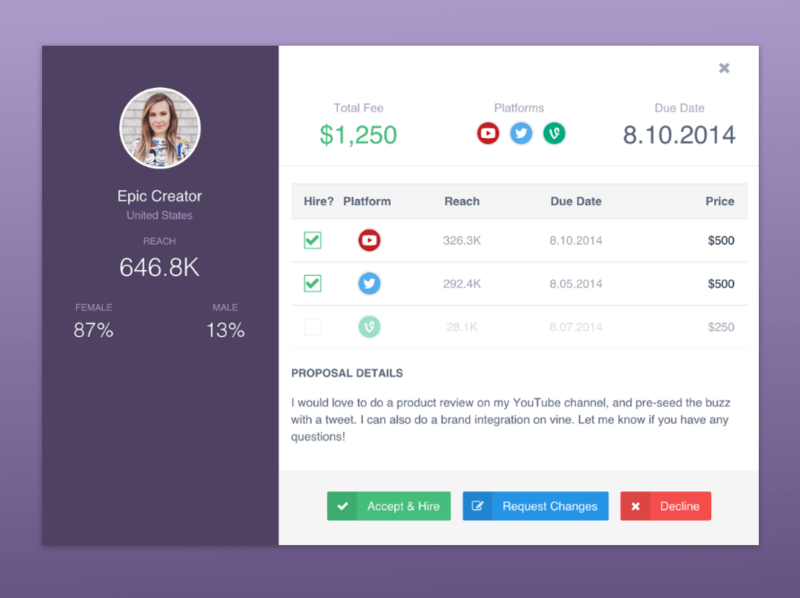 For instance, Tapinfluence and Upfluence help you find influencers and manage your workflow. It’s very similar to what we saw with social media marketing. In the early stages, brands managed their social efforts directly through platforms like Facebook and Twitter. But as social became a more integral part of marketing strategies, there was a need for tools like Sprout Social to help facilitate the process. You’ll be hard pressed to find a major brand that doesn’t use some type of social media management tool. And we’re starting to get to the same stage for influencer marketing. Don’t get left in the dust. In 2018, start to explore different influencer marketing tools to create workflows and processes for your campaigns. Not only will it save you the time, but it’ll also help you measure performance. Which leads us to our next point. Are your influencer marketing campaigns actually profitable and helping you reach your goals? While it may sound nice to say you’re working with influencers, it doesn’t really mean much if you’re not generating results. Make 2018 the year you commit to tracking your influencer marketing campaigns. While there is non-monetary value in getting mentioned by an influencer, make no mistake—you can absolutely track how much revenue influencers bring in. As we mentioned earlier, there are tools that’ll help you through the process. But one of the most basic ways to at least get started is to use UTM parameters. Assign specific parameters to your influencers so you can track the actions of every visitor they drive to your site. We actually have an entire post about how to use UTM parameters, so definitely check it out if you’re unfamiliar with how they work. Another option, depending on your goals, is to give influencers unique promo codes to share with their audience. That way, each time a customer uses the special code, you can directly attribute the revenue to that influencer. 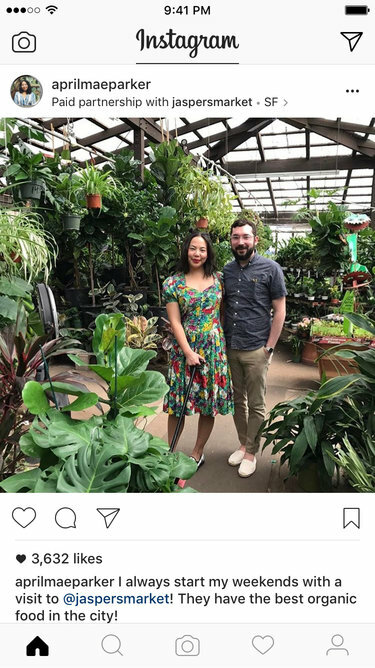 Here’s an example of a post from an influencer, Zoe, working with Plant Warrior to promote their products. Notice how she lists her unique discount code in the caption. If you’re doing more of an awareness play, you can use an influencer marketing tool to measure how much attention specific influencers are driving to your brand via a branded hashtag. For instance, Special K launched a campaign for the new year to motivate people to pursue their New Year’s resolutions. They teamed up with several social media influencers to create original content using their hashtag #FuelYourResolution. By tracking their branded hashtag, Special K can measure the impact influencers have on the campaign and compare it against their KPIs. 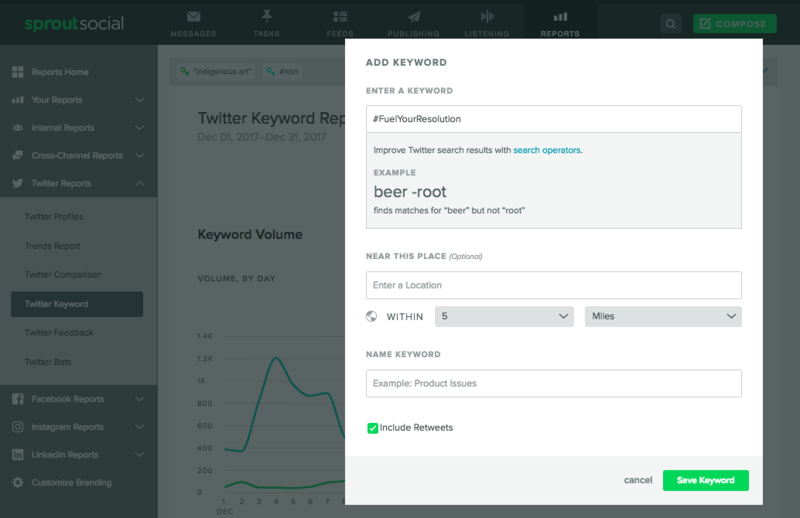 You can run similar campaigns using Sprout’s social media monitoring tools. A common misconception about influencer marketing is that it has to look a certain way. For instance, an influencer taking a photo holding your product with a generic caption about how much they love your brand. But let’s be honest, that’s boring. For example, rather than just doing a “Sponsored by” plug on a video, Segway partnered with YouTube influencer Lewis Hilsenteger of Unbox Therapy to create a piece of content that was actually useful and entertaining. In the video, Lewis shows how the Segway miniPro actually works, which is helpful for people interested in the product but want to get the opinion of someone they trust first. The video works because it’s the perfect match of the right influencer on the right network. YouTube is one of the No. 1 sources people seek for product reviews and tutorials. And the Unbox Therapy channel specializes in that specific type of video, so it’s authentic and genuine. We’ve already seen plenty of major brands taking a similar approach, but in 2018 even smaller brands with smaller budgets need to start getting more creative with how they work with influencers. Think about it. With the wave of startups on Instagram working with influencers, you need to stand out. That means creating videos, large scale campaigns and original content that serves a purpose outside of getting people to buy your product. Great content entertains, educates or invokes some level of emotion from your audience. But for whatever reason, brands tend to lose sight of that when working with influencers. Don’t be that brand. Take some time to think about what you want accomplish with influencer marketing. What story do you want to tell? How can you convey your message creatively? What benefit does your audience get from the content you’re going to produce with the influencer? A larger pool of influencers means a lower barrier to entry for brands. You might not be able to afford the top 1% of influencers, but you’ll be able to work with micro-influencers who might have less than 10,000 followers. Remember, the value of influencers isn’t their follower count. It’s their ability to capture the attention of their audience, no matter what size it is. There are plenty of brands with tens of thousands of followers, but can’t get 1% of them to actually engage or convert into customers. As you might recall, several large brands significantly reduced or pulled their advertising dollars from YouTube in 2017. While it may have saved those brands millions of dollars in poor performing ads, it also meant content creators saw their income from ads drop by over 50% in some cases. Because of all this, content creators on YouTube have to look for other revenue sources to make up for the lost ad dollars. And one way to do that is by working directly with brands through sponsored content, product reviews and partnership deals. The problem brands had with YouTube ads wasn’t that content creators were making bad content. It was moreso the lack of control they had on what videos their ads appeared on. When you’re paying for your ad to be shown, it’s kind of helpful to know where it’ll be appear. Content without context is risky business. Most brands don’t want their ads appearing on a video promoting hate speech and extremism. But influencers on YouTube still have significant reach and there’s plenty of value to be gained from working with them. Particularly if you want to reach a younger demographic. There are plenty of benefits to working directly with content creators, rather than just running ads. The influencer knows their audience and what resonates with them. So your campaigns appear much more genuine and authentic. Plus you have the flexibility of putting together your campaign from scratch. 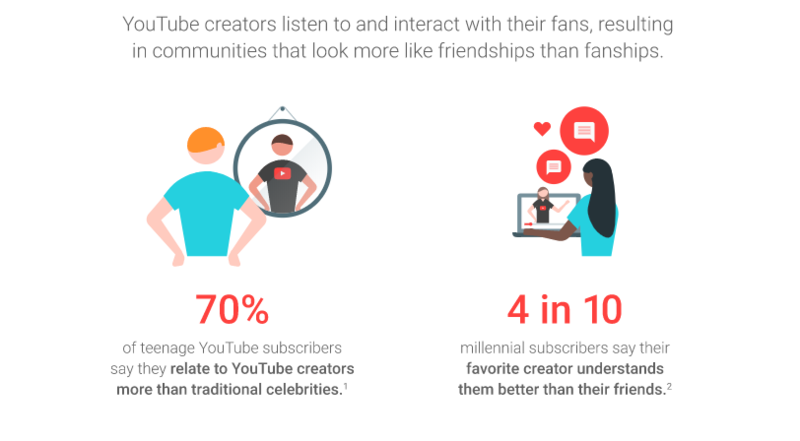 YouTube is well aware of the power of brands working directly with influencers, which is why they created their own influencer marketing platform, Famebit. With Famebit, brands can find influencers to work with, and influencers can find sponsorship opportunities. We’ve been using the phrase “influencer marketing campaign” quite a bit throughout this article. However, instead of looking at them as campaigns, think of each connection you make with an influencer as a relationship. In order to get the most from influencer marketing, focus on building long-term relationships with the influencers you work with. The way many brands work with influencers today is very transactional. You pay them X amount of money, they publish X amount posts for you. Once it’s done, you move on. In 2018, the brands that see success with influencer marketing are going to be the ones that treat influencers as partners rather than a means to an end. When influencers feel you’re invested in them and genuinely care, they’re more likely to be loyal to your brand and will promote you with more enthusiasm. You don’t want it to feel like an influencer is only promoting your products and services because you’re paying them. Their followers will see right through the facade and will be less likely to engage. Influencer marketing has become popular for one reason—it works. But there are no guarantees. Simply paying someone with 50,000 followers to share your post on Instagram won’t automatically bring in waves of sales. Stay on top of all the trends above to get the most from influencer marketing and see real success.